Pasighat (Arunachal Pradesh), Prime Minister Narendra Modi on Wednesday tore into the Congress, terming its manifesto as a “hypocrisy document” which was “full of lies”. “However, till 2014 around 18,000 houses were unelectrified… Just like them (the Congress), their manifesto is corrupt and full of lies. 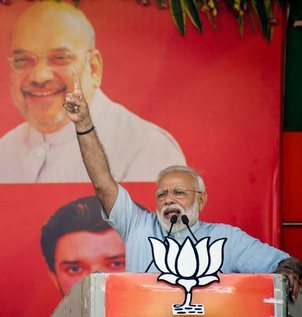 Therefore, it should be called hypocrisy document, not a manifesto,” Modi said. Congress President Rahul Gandhi Tuesday released his party’s manifesto for Lok Sabha polls, making jobs creation, addressing farm distress, bringing a single moderate rate of GST and giving Rs 72,000 per annum to poor families as key focus if the party comes to power. “We never committed the sin of betraying farmers but we introduced the mechanism from seed to market,” the PM said. Modi said the upcoming Lok Sabha polls will be about the choice between “trust and corruption, and about resolution and conspiracy”.